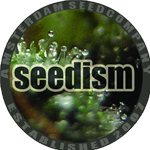 The Seedism Collective was officially launched during the High Times Cannabis Cup in 2007 by three friends with the same passion for Cannabis genetics, working together for numerous seed company\'s as well as maintaining the organic garden of the Cannabis College in Amsterdam. During their work over the past ten years at the Cannabis College in Amsterdam they have had a chance to encounter dozens of growers and breeders. Since 2007 those guys offer their very first line of seeds originating from the seedism collective, which consists of a selection of female seeds, a selection of regular seeds and three selection packs combining four strains in one package. The seeds they offer today are the result of many years of research, experimentation and countless of harvests, searching for those special and unique strains you are looking for. Seedism seeds are produced in organic gardens without the aid of chemical fertilizers.